Rob Rathsack joined Clearwater Forest’s ministry with the start of the new year in 2019. He comes to us with 17 years of experience as a camp director. His leadership skills, passion for working with youth and funds development experience will make an excellent addition to our leadership team. He grew up in Neenah, Wisconsin, just outside of Green Bay, and currently resides in Minnesota with his wife Kim and their two dogs. Rob is excited to see how the excellent facilities at Clearwater compliment the day-to-day activities during summer camp and beyond! Vicky King supervises the cleanest camp kitchen in the land (aka Clearwater’s kitchen!) and serves everyone with a smile. Outside of Clearwater she enjoys spending time with her two children and five grandchildren, camping and enjoying the outdoors. Shelley joined our Clearwater staff as official hostess earlier this year. She moved into the gate house and loves living at camp, meeting new people and enjoying the wildlife! Shelley grew up in the Brainerd Lakes area and has 4 children and 9 grandchildren. When she is not spending time with family or busy hosting Clearwater guests, she likes to sew and paint watercolors. 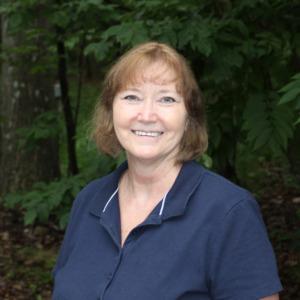 Jackie Owen provides her excellence in hospitality through ensuring that lodging is clean and ready for upcoming guests. Outside of Clearwater Jackie enjoys time with her family, being outdoors and traveling!